Man on a bench, India submitted to the ‘Primary Colors’ assignment on National Geographic. Kristian Bertel has contributed to the National Geographic Your Shot photo community with an assignment called ‘Primary Colors‘. For this photo assignment curated by Marie McGrory an assistant photo editor at National Geographic like us to capture the primary colors of red, blue and yellow. The most beautiful and complicated things in this world can be broken down into something more simple than we can sometimes imagine. The human body, in its simplest form, is a big bag of elements-protons, neutrons and electrons. National Geographic wants to see photographs that celebrate these three colors. There are no specific rules as far as how much of the color should fill the frame, and when someone looks at the photo, his or her first thought should be of the color. We should as photographers avoid having secondary or complementary colors in the photo, but as long as the red, yellow or blue is dominant, that is fine. In a world where things can become so complicated, deeply and mind-blowingly complicated, National Geographic is looking forward to boil things down to basics and celebrating the pure elements and National Geographic asks for your patience in this process. This happens with stories for National Geographic Magazine all the time, you begin with a vision, an objective, and along the way something surprises you, and things shift. Sometimes that is a wonderful thing. There are always exceptions to the rule and things that break rules well. Primary colors refer to the notion that the very large number of color sensations can be effectively simulated by combining a small number of stimuli made from a physical source, illuminated pigment mixture and so on. Primary color notions are useful in understanding the basis of human color vision, but do not completely explain all aspects of color perception. Red is a strong color and it often symbolizes love, but it has numerous meanings and it is also the color of energy, passion and action and anger. Blue is the color that is often associated with serenity, calm and spirituality and it is nature’s color for water and sky. Yellow is a pure, bright and sunny yellow, which is the easiest color to see. In color psychology yellow is the color of the mind and the intellect. 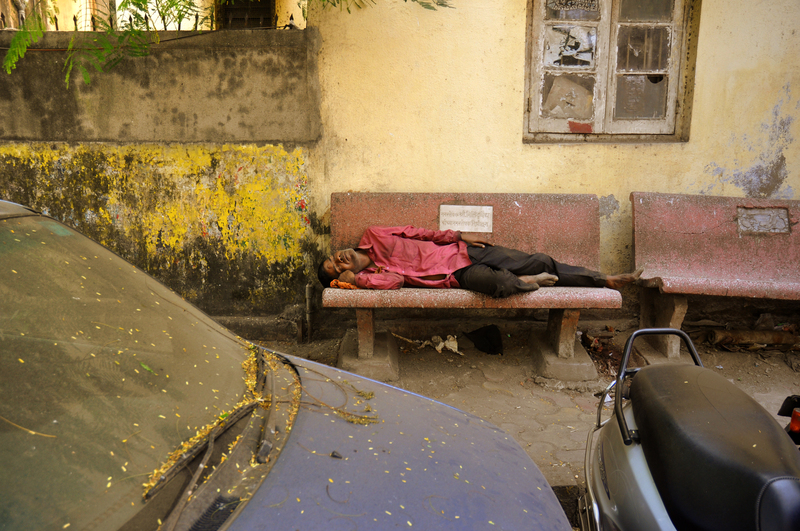 The photographer chose to participate with a photograph from Mumbai in India, where an Indian man is sleeping on a bench in the city. The primary colors of red, blue and yellow are all present in the photograph, where a splash-colored wall of yellow color can be seen next to the sleeping man in a red shirt. The blue color is also to be seen at the car in the foreground of the photo. ”– This is one my favorite photographs from my recent journey to India because the photo is so pure and calm in its form. In the populated and hectic city of Mumbai in India, this relaxing scene is a huge contrast to a city full of rush”, the photographer Kristian Bertel says.